Scraped knees and grass stains are generally a sign that your kids are outside having fun and enjoying the beautiful Colorado weather as much as possible. The minor scrapes and bruises of childhood are badges of honor when earned from tree-climbing or hours long soccer games during the summer. However, do you know what to do when it goes beyond those simple scratches and bruises? Children are, unfortunately, just as susceptible to long-term illnesses, injuries, and health issues which require more care and attention than a band-aid and a kiss. Fortunately, you don’t need to go out and get a nursing degree (if you don’t want to), just to provide the level of care your child needs. At Evergreen Home Healthcare, we specialize in providing the best pediatric healthcare we can in the comfort of your home. But what does this entail and when is in-home pediatric health care necessary? If your child needs round-the-clock medical care and attention, that can be immensely draining to take on yourself, even if you share those responsibilities with a significant other or family member. The caregivers at Evergreen Home Healthcare offer a wide range of medical services so your child can receive the medical care they need from the comfort of home, no matter how complex those needs are. Our nurses have the compassion, knowledge, and experience to handle everything from injections and medication dosing to wound care, catheter and ostomy care, IV insertion and changing, and so much more. If your child is recovering from an acute or long-term illness or is otherwise medically fragile, provide the comfort of home and family while our trained nurses provide the medical care they require. Many of our patients are special needs children who need physical, occupational, and/or speech therapy. Our pediatric physical therapy team will come to you, to save you the hassle of daily or weekly appointments at a doctor’s office or rehabilitation facility. Instead, your child can get the attention and help they need at home. This means pediatric physical therapy in the comfort of your living room – where our therapists can help your child with mobility and help you modify your home to further help your child outside of therapy times. The added benefit of having speech and occupational therapists come to your home is that many special needs children are more receptive to therapy in places they know well and are comfortable. When the stress of travel and strange places is taken away, the pediatric therapy sessions can better help your child. At Evergreen Home Healthcare, our primary goal is to provide the medical care that your child needs – which means offering medical services in the loving environment your child is familiar with and providing a staff of compassionate and knowledgeable in-home caregivers to ensure your child’s emotional needs are met just as much as the physical. We recognize that having a medically fragile child at home can be just as hard on the rest of the family and do our best to help. This can include providing round-the-clock medical care, hourly visits, and even mobility and hygiene care. Another layer to providing the best experience possible is to ensure you and your family are as educated as possible about your child’s care. Our staff are all actively licensed by the state of Colorado as well as properly trained, licensed, and insured. So, not only can the Evergreen Home Healthcare staff offer expert care no matter what the medical need, they can teach you many of the skills needed so you can feel more sure about caring for your child when the in-home caregivers aren’t there. We also have the resources available to help you formulate a long-term care plan, financial plan, and conduct emotional assessments to make the entire process as easy as possible on you and your family. No matter what your child’s needs, trust their care to the compassionate and knowledgeable team at Evergreen Home Healthcare. 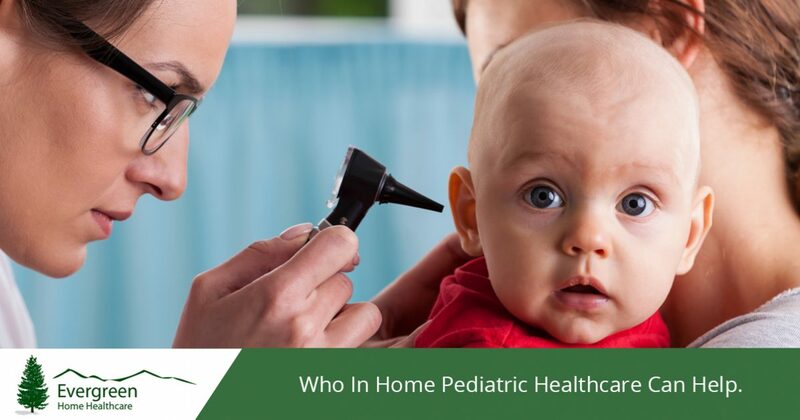 Contact us today to learn more about our pediatric home care services, including pediatric physical therapy, in-home medical care, and more!